We are gonna to start our new section #FrankSpeak under the dome of PcSkull- technical sound web house. 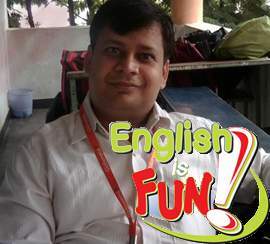 Today we have the stunning, marvelous, enthusiastic personality to delight our reader with Exclusive Interview of Amlesh Pande- English Trainee and enthusiastic blog writer. Q1:First of all tell us about Yourself. A strong background of 16 years and diversified accomplishments in Training, Coaching and Mentoring professionals employed with Corporate as well as aspiring professionals aiming to kick start their career in enhancing their soft skills and proficiency in English language to sustain their career growth as well as effect significant improvements in their potential leading to overall professional growth. A very innovative and stylish trainer who has immense passion in imparting experiential learning through activity based training focusing on highly interactive and entertaining sessions. Q2: Welcome to PcSkull. Tell us since when trainer has been a part of your life? Was there any motive or inspiration as a backbone of it? I was from a hindi medium background till my intermediate and had my share of humiliation as well as failures during the initial phase of my career which motivated me to take up English as a challenge and added the fuel to be a guide for similar kind of aspiring students by sharing my methodologies and experience. Q3: What did you spend to achieve this zenith? I did not spend anything but invested my efforts, focus and time. Q4: What is your training all about? Which topics you cover there? Is that you alone running/maintaining the training, or have a team? # Preparation of numerical aptitude, reasoning and verbal aptitude along with resume writing, GD and Personal Interview. # Imparting training on attitude building, business communication, motivation skill, presentation Skill, Leadership skills, Interpersonal skills, Selling skills, Organizational behavior, Self-Esteem, Goal setting, Success maneuvering, Subconscious mind and habits, Time Management, Team Building & Moral and Aesthetic Values. I am managing a team of 30-35 members in my company Globarena Technologies private limited. Q5: Being Techie, what is the role of English in their career rather than just language? English being a global language is going to play a crucial role in one’s career in terms of growth, understanding the latest technology and positioning oneself as well. Q6: Any tips to work out to improve English? It is like going to a gym for body building where result will be there only if you really speak in this language, listen to it for 2-3 hours, read a national newspaper on a regular basis and write your daily life experience. Q7: Is training for you just a passion or a medium for earning too? Does it help you to earn enough cash to quit a 9 to 5 day job? My objective was to serve the society and country as well as support myself financially and this profession gave me all. Q8: How has your profession helped you other than money? I have a sound sleep every night and feel I the heaven when a student gets a job where I was a medium of his learning and support. Q9: From the golden bucket of your splendid career as trainee, what tips you would like to share with the fellow? Q10: Do you believe being trainee completes you? If yes, tell us how? Yes because I feel as if I am not adding value to myself as well as others if I stop it. Q11: Are you satisfied with whatever you have been achieved yet?Or something else that you want to achieve? I am totally satisfied with whatever I have achieved and hope to be always satisfied as I am what I have chosen for myself. Q12: What was the happiest and gloomiest moment of your life? The happiest moment was going through the gloomiest moment with ease and emerging stronger whenever faced it again. Q13: If you are sponsored to travel to couple of destinations, where you need not to worry about costs for food, hotel or anything. Which destinations would you pick up, and why? Would you like to take someone along with you? If yes, whom? I do not believe in free lunch. Q14: What would be the one thing you’d change about yourself? I would like to change with ever changing changes in this world. Q15: What is your deepest fear? I should always be on my toes as fear keeps me alert and alive. Q16: If you could meet one person, dead or alive, who would it be? Obviously myself because our life is such a journey where we rarely meet ourself. Q17: what does make people’s life simple or complicated? Their ability to simplify complications or vice versa……..
Q18: Who are your favorite writer, whom you read frequently? Q19: Any special message you would like to share with your readers as well with everyone else? The most extraordinary thing in this world is to be an ordinary person. Q20:As you are passionate reader, List some of books that awes you. And would you like to suggest some books for youth. I recommend the youth to read Swami Vivekananda’s book. Q21:Your words regarding social issues like corruption, unemployment frustration…that stirred the ambiance? And What should be the role of youngsters to change this? This society is based on weak foundation and outdated ideals resulting in this situation. The youngsters need to take responsibility of themselves only and forget about the rest. Q22:Biggest achievement as ever you got. Accepting and loving myself the way I am……. Q23: List out some people you believe should be interviewed by PCSkull. All the seniors of your college and contemporaries who have experienced or are experiencing their career……..
so that their straight from heart experience enlightens others………….. Thanks a lot for giving us time and delighting PCSkull reader with your presence. If you have any question, feel free to ask him. You can ask him any query to improve and to get command on English. Very nice questions and simple but powerful answers! Thanks to both Interviewer and Interviewee for sharing such a balanced diet for our skull..